Easy entertaining options … Lord knows I’m always on the look out for ’em. I love unexpected/unplanned gatherings. For me, spontaneity always breeds a fun low stress atmosphere. I’ll gladly take any excuse to casually entertain without over-thinking it. So when you’re in the neighborhood, and you don’t mind an easily excitable puppy jumping on you upon arrival, you’ve always got a standing invitation to swing by. My cousin bopped in this past Friday evening. What a lovely surprise it was. 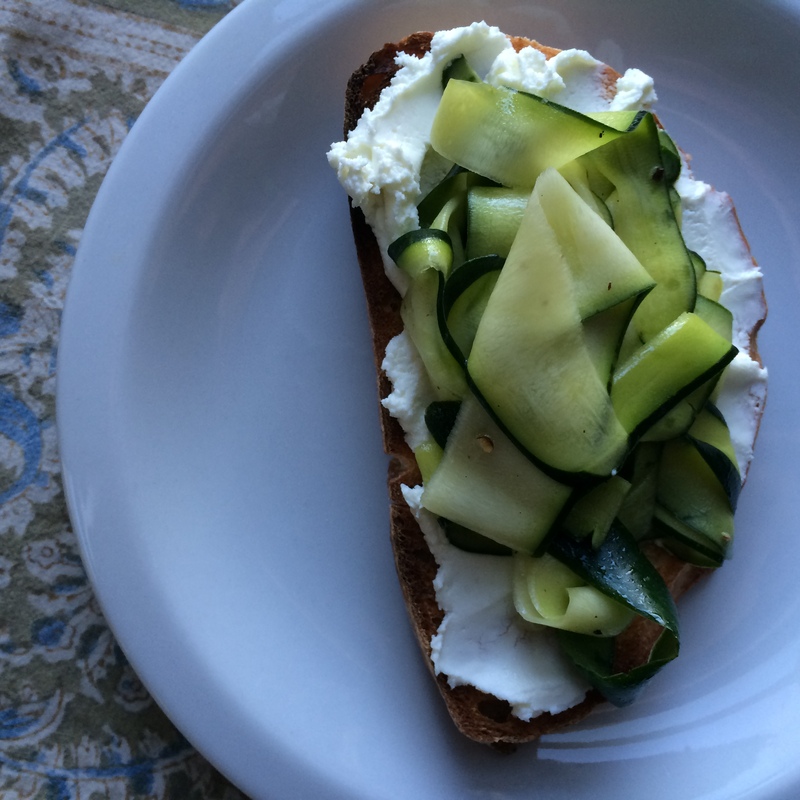 We quickly whipped this bruschetta together, poured some vino, and headed to the roof for the sunset. Not premeditated at all. I had all the ingredients in the kitchen already. 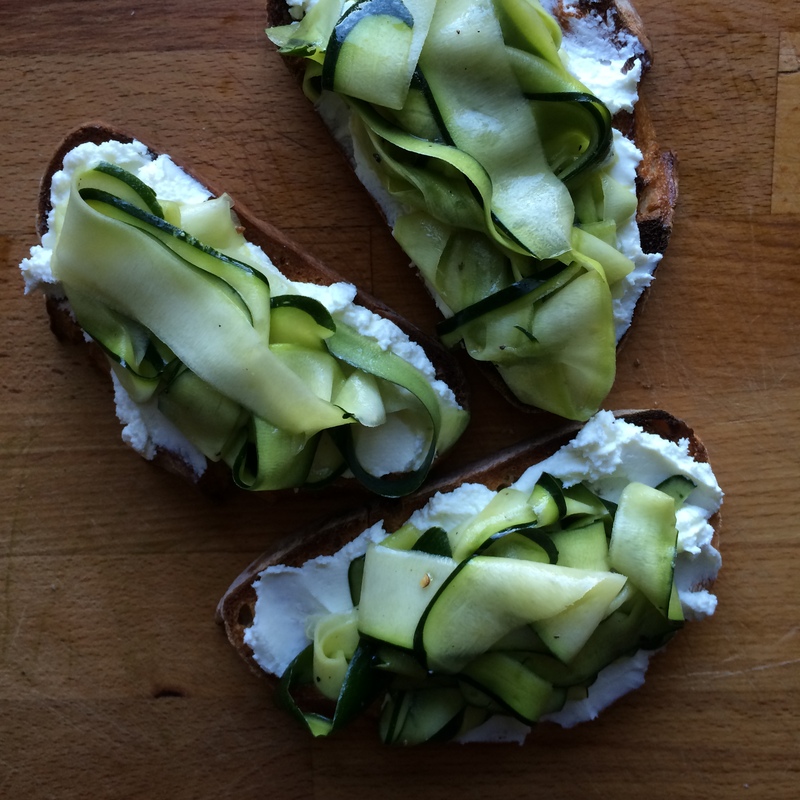 Zucchini lives in my refrigerator this time of year, and I’m always stocked with goat cheese. I also happened to have a few bottles of vino on hand (that part may have been premeditated). Easy entertaining, 101. 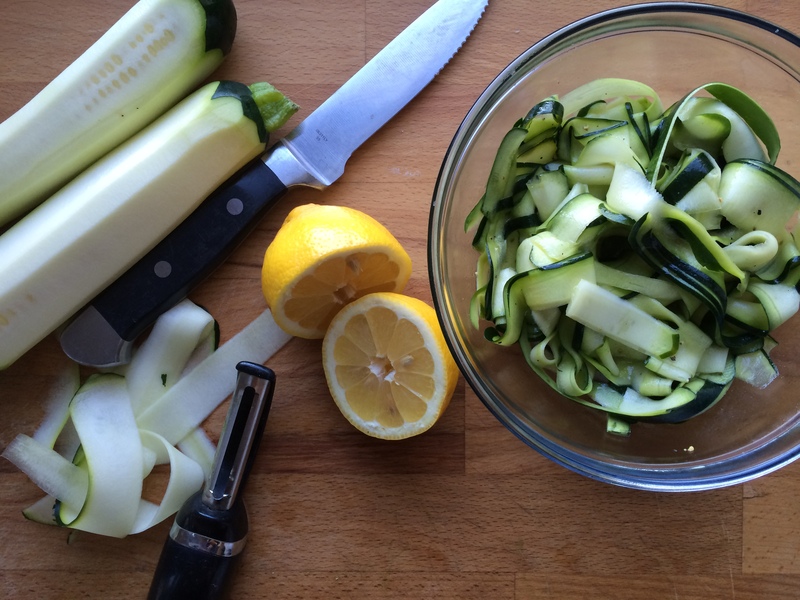 Place zucchini ribbons in a bowl and toss with 1 tbsp olive oil, 2 tbsp lemon juice, salt, and freshly cracked black pepper. Let marinate when you prepare the rest of the bruschetta. Brush both sides of the sourdough bread with the remainder of the olive oil. 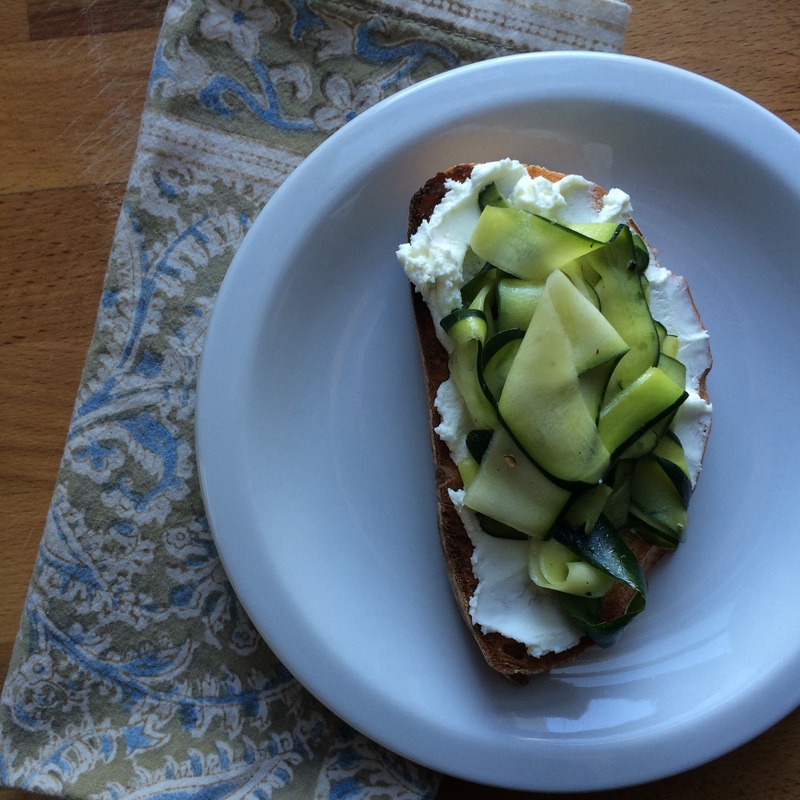 Grill over medium-high heat for 2-3 minutes per side, or toast in a 400 degree oven for 8 minutes. When bread is still hot, rub the whole garlic clove vigorously over one side of it. 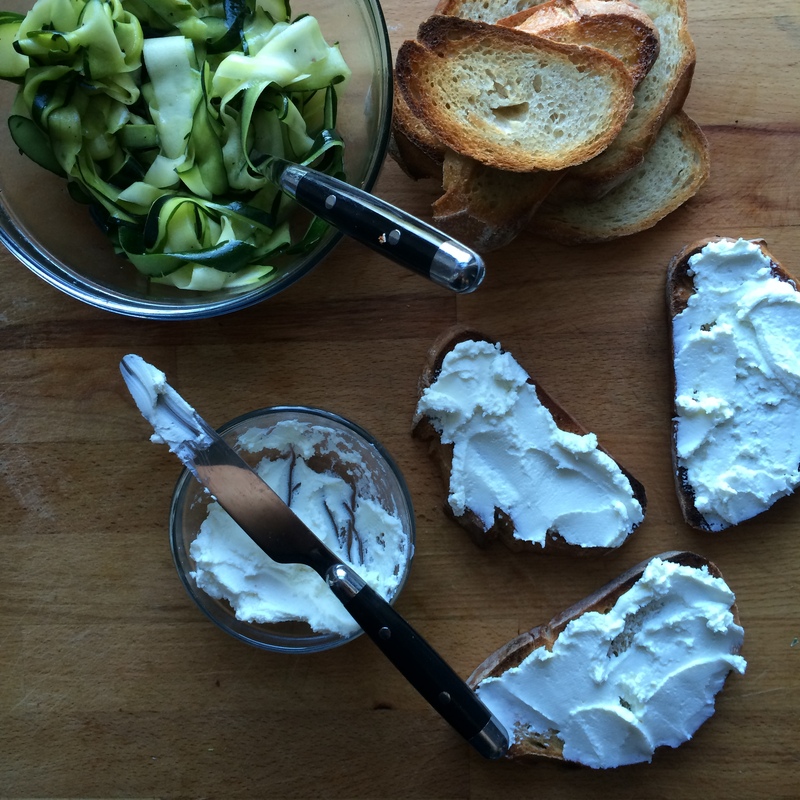 The rough surface of the bread will shred the garlic like a grater. Place bread garlic rubbed side up on a platter. 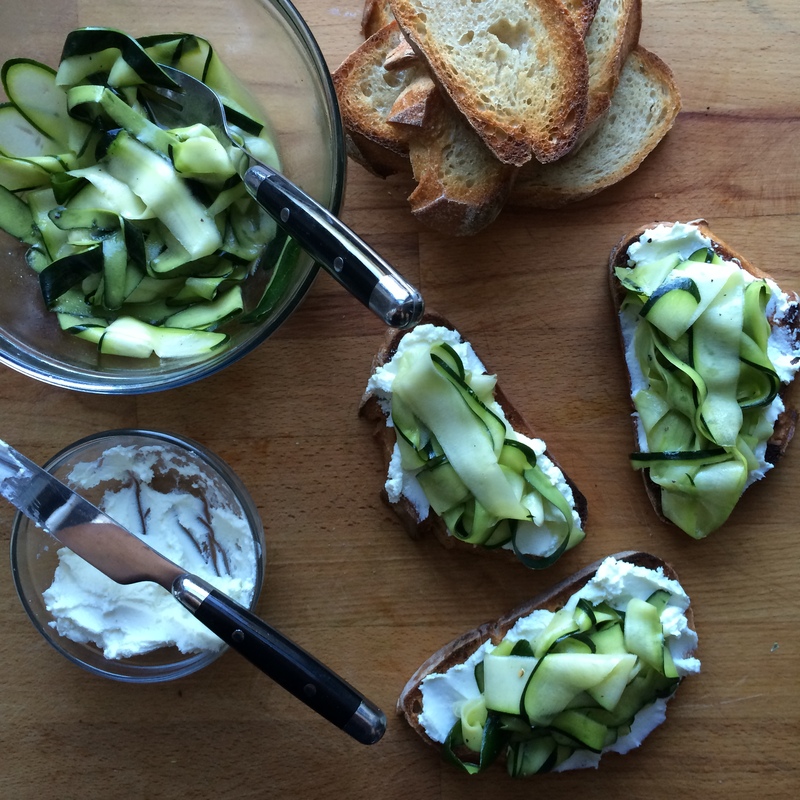 Spread with the softened goat cheese and top with zucchini ribbons.